It's not clear if it is goodbye to England or the world, but Paul Simon has named his upcoming appearance at the British Summer Time Festival as his "farewell performance". Simon closes the festival on Sunday, July 15 with "Homeward Bound: The Farewell Performance" with special guests James Taylor, Bonnie Raitt and more to be announced. It's not the first time that Simon has hinted about retiring. In 2016, he said "Showbiz doesn’t hold any interest for me. None." to which he added "You're coming towards the end." "It's an act of courage to let go. I am going to see what happens if I let go. Then I’m going to see, who am I? Or am I just this person that was defined by what I did? And if that’s gone, if you have to make up yourself, who are you?" He also hinted that a 2016 show at Forest Hills in New York could possibly be his final performance. It wasn't and he did some touring last year. 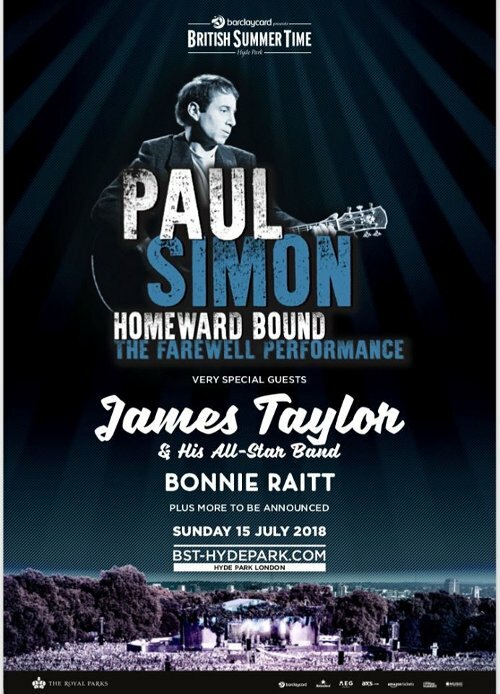 James King, senior vice president of AEG, said "There is no finer way to close Barclaycard presents British Summer Time Hyde Park 2018 than watching Paul Simon take London on a musical odyssey through one of the most remarkable song books in history. Paul, James and Bonnie all together on the Great Oak Stage has to be the show of the summer and a truly unmissable event." 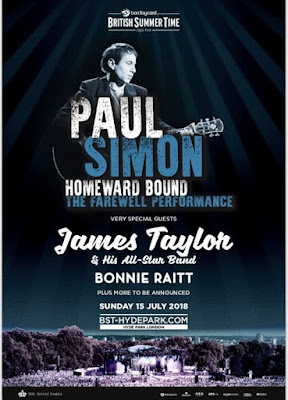 If it does come to pass that this is Simon's last performance, it will cap one of the most successful careers of the last century from his 1958 debut single through Tom & Jerry, Simon & Garfunkel and his many solo albums that were capped by the multi-award winning Graceland.